William S. Hart, date unknown. 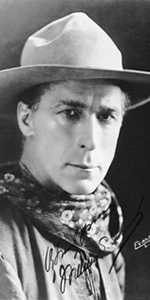 William Surrey Hart was the first real cowboy movie star. Entering films just as they were expanding from shorts to features, he projected the mythic qualities of western men, both good and bad, who were usually out for revenge, sometimes tempered by the love interest. Born to an English father and an Irish mother, Hart joined a traveling theatrical troupe when he was 24, in 1888. Desperate to make a name for himself, Hart leapt from company to company, always traveling throughout the United States. Hart became a Shakesearian actor (!) who had some success on Broadway; he played Messala in the first Broadway staging of Ben-Hur in 1899. He is known to have directed productions in Asheville, North Carolina in late 1900; Hart had moved the family to Asheville hoping to make it the family seat, but his sister died of typhiod fever in 1901, after which the family relocated to Brooklyn, New York. Hart appeared in several Broadway plays between 1903 and 1912, including a staging of The Squaw Man in 1905 and The Trail of the Lonesome Pine in 1912. Hart played Messala in a 15-minute version of Ben-Hur (released in December, 1907) for the Kalem Company; Hart was hired for having played the part on stage, but the producers didn't bother to get the film rights. They got sued. It wasn't until 1914 that Hart was roped into making films on a regular basis; since he was such a big star on stage, he took lead roles in films quite naturally, mastering screen acting almost instantly. After doing a pair of short films, Hart's first feature-length film was The Bargain. (released in December, 1914). Hart's profound interest in the old west must have been an easy sell for producer Thomas Ince; Hart knew and was friendly with Wyatt Earp and Bat Masterson. Hart was a stickler for authenticity in his films, his theatrical leanings insisted on the proper costumes and props. Hart and Ince agreed that Hart should make short films, so in 1915 and 1916, the 17 shorts and four features were all directed by Hart. He became the most popular western star; exhibitors voted him the biggest money-making film personality in the United States. In 1917, Hart began making features for Adolph Zukor's Famous Players-Lasky combine. He began to regularly ride a brown and white pinto he called Fritz, who became the first equine movie-star. Hart was set up with his own production company, located in Newhall, California, just north of Los Angeles, with Hart directing almost all of his films. They have names that look good on posters: The Silent Man (releassed in November, 1917), where he played "Silent" Budd Marr, or playing the title roles in Selfish Yates (released in May, 1918), Shark Monroe (released in June, 19181), or Riddle Gawne (released in August, 1918) or Square Deal Sanderson (released in June, 1919). As Hart moved into the 1920s, the complications of writing, producing, directing, and starring in his films began to get thin. Assigning directing and co-writing chores to Lambert Hillyer gave Hart enough time to get married to starlet Winifred Westover (1899-1978) in 1921. They had met while making John Petticoats (released in November, 1919). They had a son, William S. Hart Jr. (1922-2004), but the marriage was a failure. The two separated in 1922, and divorced in 1927. Times were a-changin' and Hart's formula of stiff-lipped sacrifice and honor began to pall in Prohibition Jazz-Age America, where everyone who drank was a criminal. Tom Mix came along with fancier costumes and more action — in 1924, Paramount dropped Hart's pictures. He self-financed Tumbleweeds, releasing it (in December, 1925) through United Artists. The rich and complex story of the Cherokee Strip land rush of 1893 is now considered Hart's best film. It was also his last. He retired to his home in Newhall (still open today as a museum), wrote many western books and stories, and died there in 1946, at the age of 81. Grauman's Chinese Theatre, Hollywood, California. 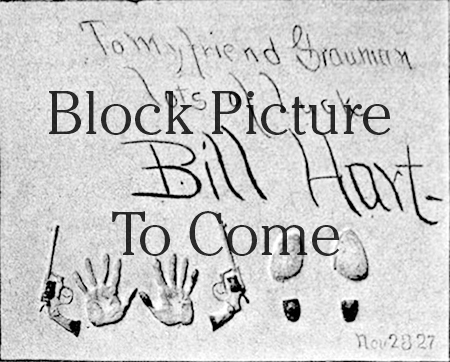 William S. Hart Forecourt ceremony, Monday, November 28, 1927. 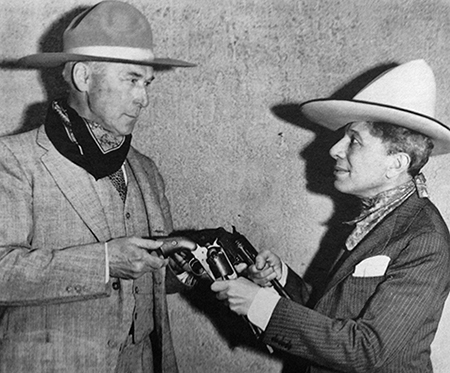 William S. Hart accepts a challenge from Sid Grauman in this only existing photo from the ceremony.